(Sorry for the blurry picture! I didn’t notice it was blurry at all until I went to do this post. But hopefully you get the concept of the color even if it isn’t in focus). Happy Monday everyone! I have had an extremely lazy day and I’m a little embarrassed to say that I had to force myself to get off the couch to write this post. I have thoroughly been enjoying clearing out all the shows and movies saved on my DVR, while still in my PJs, wrapped in a heavy comforter all day. I figured I would show you guys a polish that I really have been liking lately. There’s something about a really simple polish that really captivates me. Sometimes a clean and classy manicure make me feel more put together than a manicure I spent 3 hours doing. 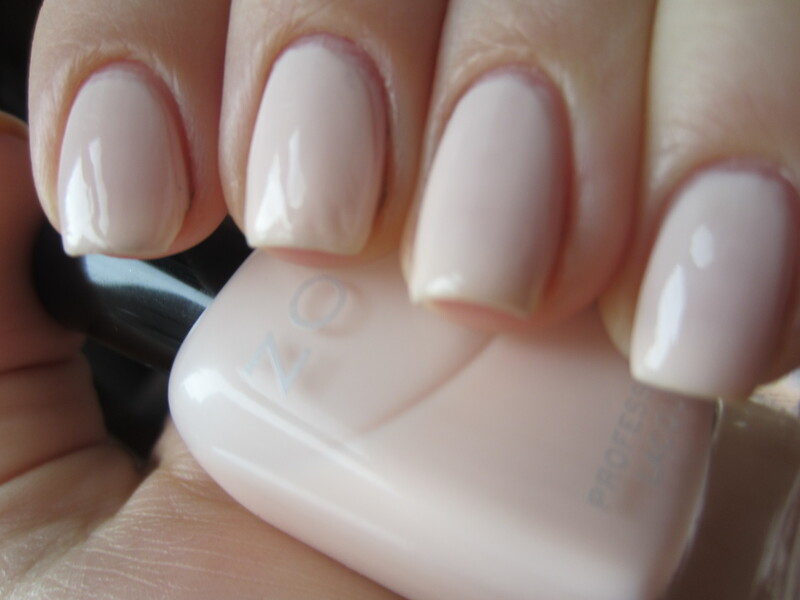 Zoya “Stephanie” is a really light and sheer baby pink. If you know me then you know that sheer baby pinks are the most annoying kind of polishes to me, next to bar glitter. But if you have the time and patience to get this baby opaque, its so clean and sophisticated. Be careful not to rush application on sheer baby pinks because if you jump the gun on putting a top coat on that final coat that gets it opaque, you can get the rippling effect that I did near the tips (check out my middle finger). The formula was tricky to say the least, but like I said if you have patience then this one doesn’t disappoint on the final result. This is 4 coats and each coat is extremely streaky. This is a creme formula, not a jelly, so each coat goes on really milky and uneven. I don’t think you could ever wear this as a jelly sandwich. The dry time took a while on coats 3 and 4 but was nice on the first 2. Overall, I love the look of this polish so I’ve been wearing it like crazy this month! But I dread applying it because I know it will be a good hour long process. What do you guys think? Do you have any polishes that you hate the formula but love the look so much that you wear it anyways? Baby pink is cute but i always think it’s better when you’re a bit tanned :-). totally agree! i love baby pink in the summer. and you’re gonna get so tanned when you go to turkey in 2 months! Soooo pretty! Bummer it takes so much effort though. i know, but sometimes its totally worth it because it is really pretty!